Six Flags Hurricane Harbor is a multi-million dollar water park inside the Six Flags over Georgia theme park, just west of Atlanta. The park offers several rides, pools, play and lounge areas, and is the perfect way to cool down on a hot southern day. Calypso Bay is the park’s 38,000 square foot giant wave pool. The state-of-the-art wave system offers 4-foot high waves all day long, while the shallows offer smaller waves for younger visitors to safely play in a simulated ocean-like environment. Two large wave generators produce eight different wave patterns to keep the entertainment varied. Visitors may take inner tubes on the waves to ride, or just to float. For younger visitors, Paradise Island offers 50,000 square feet of interactive, water-soaked play area. Interactive elements include water gadgets, tipping buckets and water cannons. Climbing elements include rope nets, platforms, ladders and stairs, that lead to kid-sized water slides. Three giant buckets of water dump when they’re full, sending 2,000 gallons of water to the playscape below. The Bonzai Pipelines are among the more thrilling water park elements. 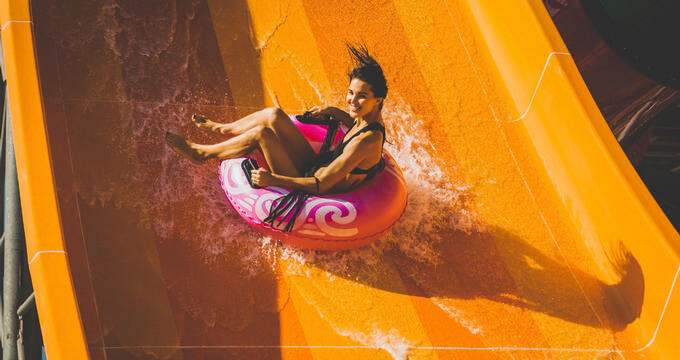 With several sharp turns over a four-story drop through enclosed tunnels, the slides drop guests at speeds of over 16 miles per hour into a giant bowl that circles them down towards a corkscrew “drain” to the pool below. Over one half million gallons of water pump through three slides, totaling 944 feet. Tsunami Surge is the world’s first zero gravity water park attraction. Groups of four descend on a cloverleaf shaped inner tube through a high-speed five-story drop into 125-foot wide bowl. The bowl creates a whirlpool effect that then sends the group through a moment of weightlessness down an enclosed tube to a smaller bowl, for a final whip of zero gravity before descending into the pool below. The attraction pumps over 300,000 gallons of water per hour. Cabanas surround the Calypso Bay Wave Pool and offer a private venue for relaxation out of the sun. Three different levels of cabana rental are available, standard, gold and platinum. All cabanas include lounge chairs and tables, ceiling fans, mini refrigerators, and coolers. Gold and platinum packages offer additional food and beverage services, tube rentals and ring toss bucket games. Additional amenities at the park include a café, showers and locker rooms, and ample deck space, lounge chairs and shaded areas. A retail shop offers swimwear, sunscreen and beachwear. Lifeguards are always on duty and complimentary life vests are available for any guests who are not confident about their swimming ability. History: Six Flags Over Georgia was the country’s second Six Flags location, and opened in 1967, making Six Flags the first company in the United States to successfully operate two theme park locations. Hurricane Harbor had been a successful addition to several other Six Flags theme parks throughout the country, beginning in the 1990’s. In 2013, Six Flags Over Georgia announced it would be adding a Hurricane Harbor to the Georgia park. Hurricane Harbor opened at Six Flags over Georgia with the summer 2014 season. It remains the largest expansion in the park’s 51-year history. Hurricane Harbor was the first major upgrade as part of an ongoing capital investment plan to upgrade the park’s facilities. 2015 investments included the addition of the 70-foot tall Giant Loop ride, The Joker: Chaos Coaster, as well as the tilt-a-whirl Harley Quinn Spinsanity ride. In 2016, major projects included the addition of two children’s play areas. Ongoing Programs and Education: The addition of Hurricane Harbor replaced the park’s amphitheater, but live entertainment continues throughout Six Flags. Looney Tunes themed parades, block parties and dance parties take place throughout the park daily. Rhythm and Grooves is a live music dance showcase, while ShenaniGuns is a Wild West themed comedy show. The park is host to theme days honoring mothers, fathers, the military and more with discounted admissions. Special events include the Southern Star Music Festival and Music in the Parks, which feature the performances of area school bands, orchestras and choruses in a competitive format. What’s Nearby: Hurricane Harbor is located within the Six Flags Over Georgia theme park, and is included with admission to the park. The park offers eight thrilling roller coasters, a variety of family and children’s rides, as well as live entertainment, dining and shopping.